A win would put San Diego (8-0, 2-0) in charge of the Central League race. The Cavers haven’t had a 10-win season since going 10-1 in 1958. QB Quinn O’Connor and RBs Raiden Hunter and Jayden Wickware are the keys to the offense. MLB Eric Orfanos has 71 tackles and a pair of interceptions. Crawford (6-2, 1-1) is led by QB Shawn Balala. The Metro Mesa League belongs to Otay Ranch, but Mater Dei (4-4, 1-1) is on the Division II playoff bubble. So the Crusaders find themselves in a must-win situation. Olympian (4-4, 1-1) is a solid Division I playoff team. QB Nico Mendoza has thrown for 1,428 yards, while MLB Jared Desmond has 94 tackles. Injuries derailed Mar Vista (5-3, 0-1) in last week’s Metro South Bay League loss to Sweetwater. Chula Vista (4-4, 0-1) attacks on the ground behind Victor Agraz and Kajahan Duncan. DE Ubaldo Nolasco has 10 sacks. Helix (7-1, 3-0) enters this key Grossmont Hills League showdown ranked No. 2 in the county and No. 19 in the state. QB Carson Baker has thrown for 23 TDs with only three interceptions. Isaac Taylor-Stuart has 1,078 yards rushing, receiving and on returns. Grossmont (6-2, 3-0) is led by QB Jamie Odom, who has 1,653 passing yards. Desmond Carter and Thomas Mangum are his key targets. Helix has won the last 20 games between these two powers, by a combined score of 832-241. Ranked No. 10 after back-to-back losses, Madison (6-2) faces another challenge in this nonleague game. The Warhawks haven’t lost three in a row since they opened the 2010 season 0-3. RBs Kenan Christon and Ke’ontae Springs have 1,497 combined rushing yards and 18 TDs. Lincoln (7-1) is ranked No. 7 and has won five in a row by a combined score of 228-20. QB Asante Hartzog has thrown for 1,975 yards and 19 TDs, while RB Kenyon Sims has 892 rushing yards and 17 TDs. Top-ranked Mission Hills (8-0, 4-0) faces another tough Avocado League foe. Ranked No. 12 in the state, Mission Hills is led by QB Jack Tuttle and big-play WRs Chris Olave and Maurice Jones. The Grizzlies can’t get caught looking ahead to next week’s Discovery Bowl against crosstown rival San Marcos. Torrey Pines (6-2, 3-1) is ranked No. 5 in the section and attacks behind a wing-T offense. WB Jason Heine has 1,004 yards passing and running. RB Mac Bingham has 860 rushing yards and 15 TDs, while Sully O’Brien has 630 yards on the ground and seven TDs. It’s a nonleague game, but it holds playoff implications for both teams. Kearny (7-1) is ranked No. 5 in Division IV and is looking to move up. QB Kenyon Williams has 1,505 yards passing and 17 TDs. RB Brenton Bell has 1,250 yards and 14 TDs. La Jolla (4-4) is ranked No. 8 in Division III and is also looking to move up. QB Trevor Scully has 1,654 passing yards and 19 TDs. Gabe Solis, his favorite target, has 40 catches for 756 yards. Point Loma (5-3, 1-1) has won two in a row, beating Mira Mesa and Madison since a loss to St. Augustine. Cathedral Catholic (4-4, 1-1) has won two in a row since a loss to Madison and needs a win to make next week’s Holy Bowl game against St. Augustine a battle for the Western League title. Ranked No. 3 in the county, Ramona (8-0, 4-0) can clinch the Palomar League title with a win. The Bulldogs are led by QB Casey Buggeln, who has thrown for 931 yards with 10 TDs and zero interceptions. RB Sean McDonald has 777 yards and 11 TDs, while Tristan Stacy has 1,095 yards running, receiving, passing and on returns. MLB Jack Drews has 70 tackles. Ramona has had only four nine-win seasons since 1958. Poway (3-5, 2-2) comes into the game having lost its last two, to Westview and Vista. 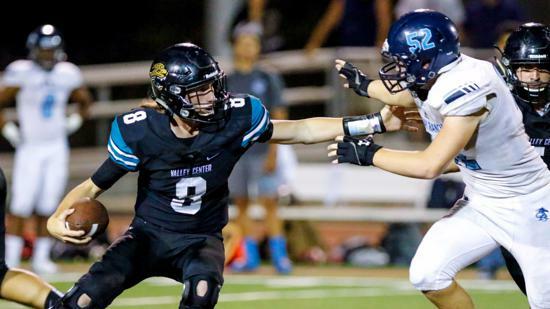 Escondido (4-4, 1-1) has won two in a row by a combined score of 40-6 and can spoil Valley Center’s Valley League championship-clinching party. Valley Center (7-1, 3-0) has won five in a row since a loss to El Capitan. The offense centers around QB Rikki Mazzetti, RBs Mateo Sinohui and Ronnie McCowan, and WR Zachary Mahrenholz.